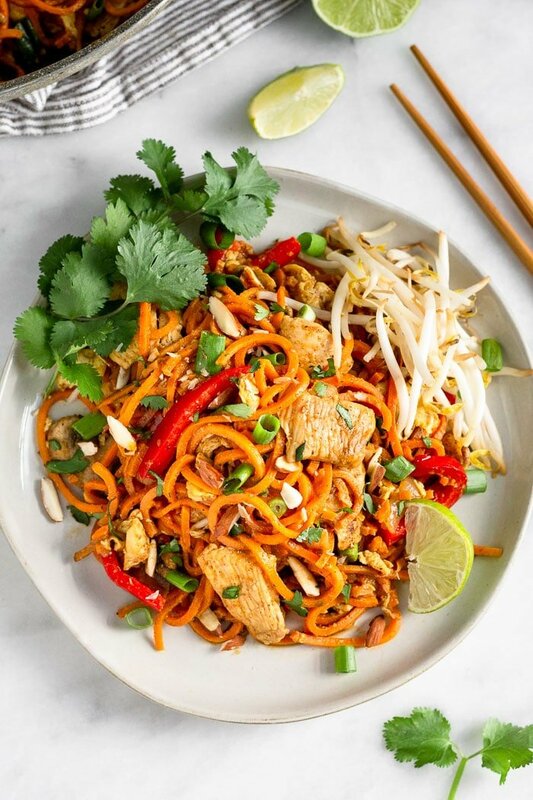 This healthy chicken pad Thai uses sweet potato noodles, chicken, veggies, and a delicious healthy pad Thai sauce. 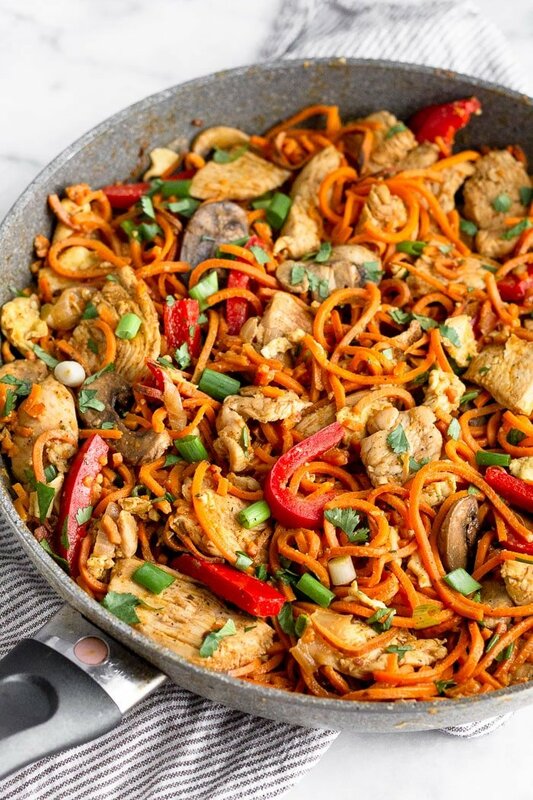 Made in one pan and ready in 30 minutes! Paleo, Whole30, and gluten free. This post is sponsored in partnership with NOW Foods. All opinions expressed (as always) are my own. I only partner with brands I trust and personally recommend – thank you for your support in helping make Eat the Gains possible! We did it! 30 minute meal solutions is done! 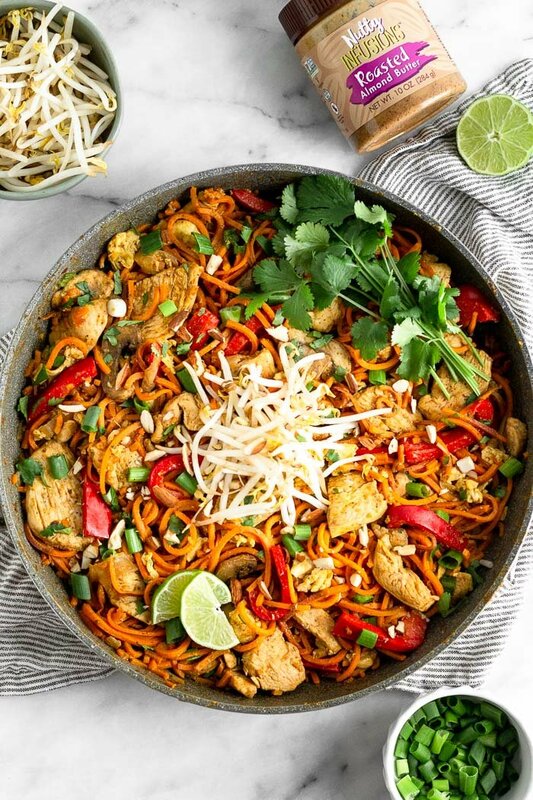 And we are finishing strong with this paleo & Whole3o healthy chicken pad Thai!! 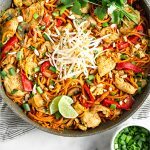 If you missed it, this whole month has been dedicated to one pan easy dinners made in 30 minutes or less. 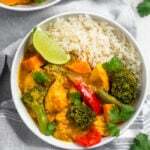 We kicked it off with a sausage soup, made 30 minute curry, a chicken balsamic chicken skillet, salmon in the Airfryer, instant pot eggplant parmesan, and now are finishing with a quick and easy healthy Thai recipe! When we get Thai food, I usually always get some kind of curry. 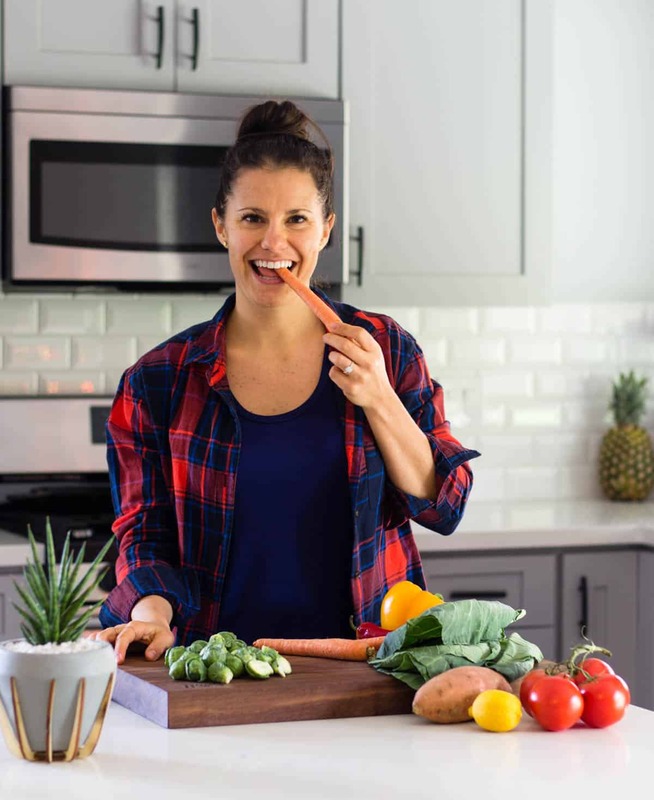 After switching to a mostly paleo lifestyle, it became one of my favorite things ever. But I used to love pad Thai! 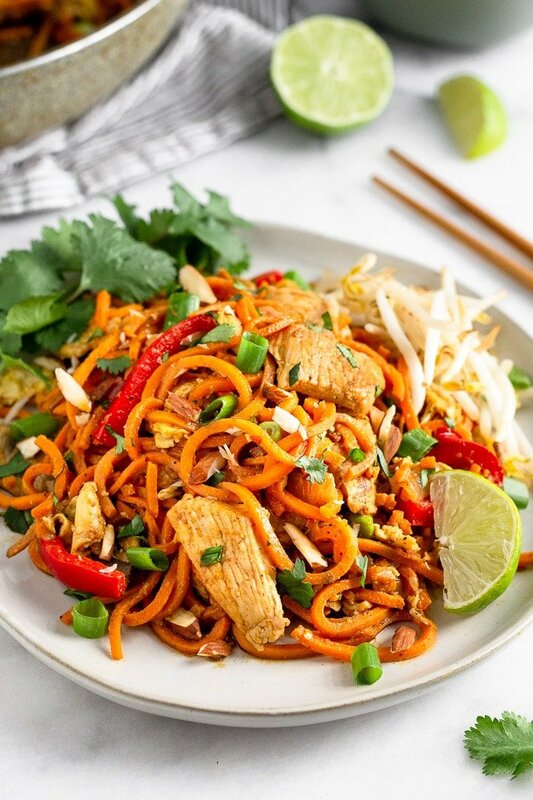 It was my go-to when eating at Thai restaurants – the chewy noodles, fresh herbs, tangy sauce, and whatever protein I want. We actually ordered some take out the other week and Michael got pad Thai. I obviously took a couple (read a lot) bites, but wasn’t that impressed. I wanted more flavor, more veggies, and protein. So I am taking matters into my own hands and we are making our own healthy, flavor packed version! 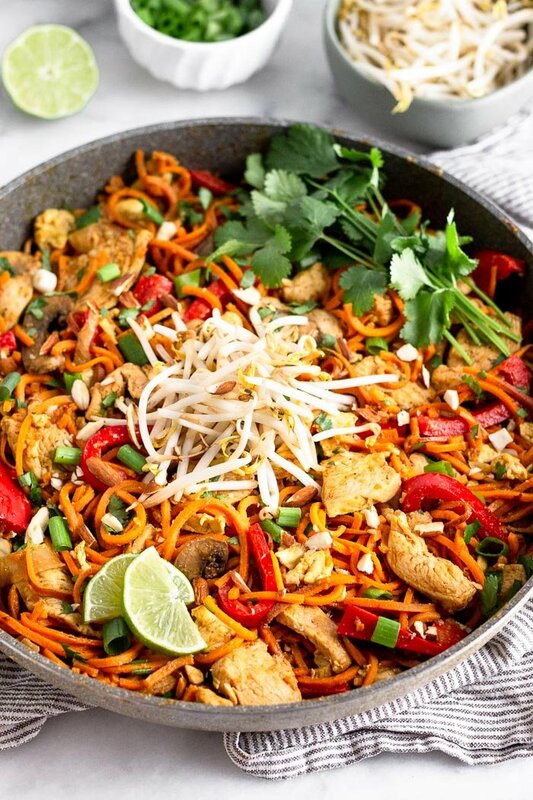 toppings of choice – bean sprouts, lime juice, chopped almonds, red pepper flakes…. First, make sauce and set it aside. 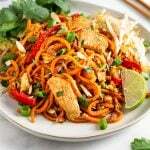 I will talk a little more about making a healthy pad Thai sauce below. Second, scramble the eggs in the oil. I did this first to make sure they are light and fluffy and not cooked all the way through, since we will be adding them back in at the end. Next, sauté the onion for a few minutes. Then add the chicken and garlic and cook for 2 minutes until the chicken browns on the outside. Add the sweet potatoes and sauté for a few more minutes. Then the peppers and mushrooms for two more minutes. Finally add the sauce and let it simmer for 1-2 more minutes to let all the flavors combine. Stir in the green onions and cilantro and top with toppings and enjoy! All you have to do is add to a bowl or blender and mix to combine! 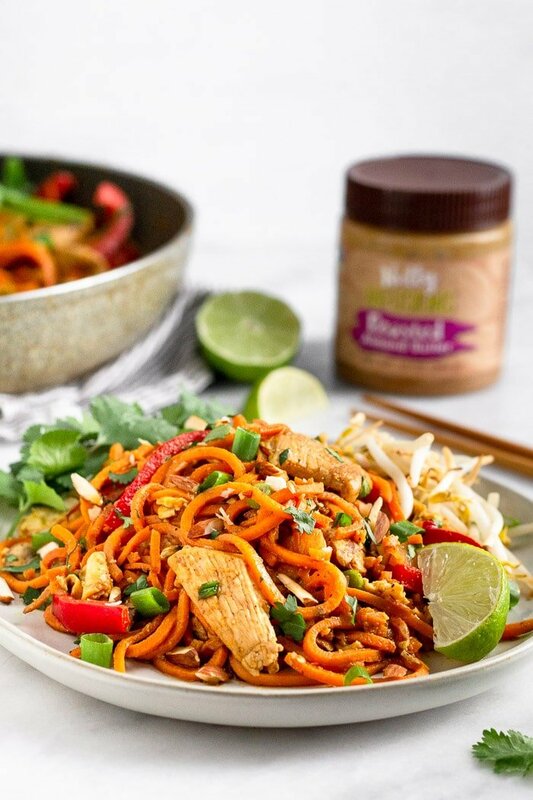 This sauce is typical of authentic pad Thai sauce with the addition of almond butter. 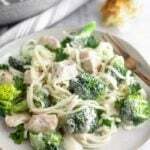 I love the creaminess it adds to the dish and it really helps thicken the sauce without the addition of any added flours, corn starch, or gums. The key when looking for an almond butter is finding one with just almonds in the ingredients. NOW Foods just launched their new line of nut butters and I couldn’t be more excited. The Roasted Almond Butter is made with dry roasted almonds without any added flavors or sugar. It makes the perfect addition for snacking, adding to sauces, or just eating with a spoon. You can find the new nut butters on NOW Foods website! 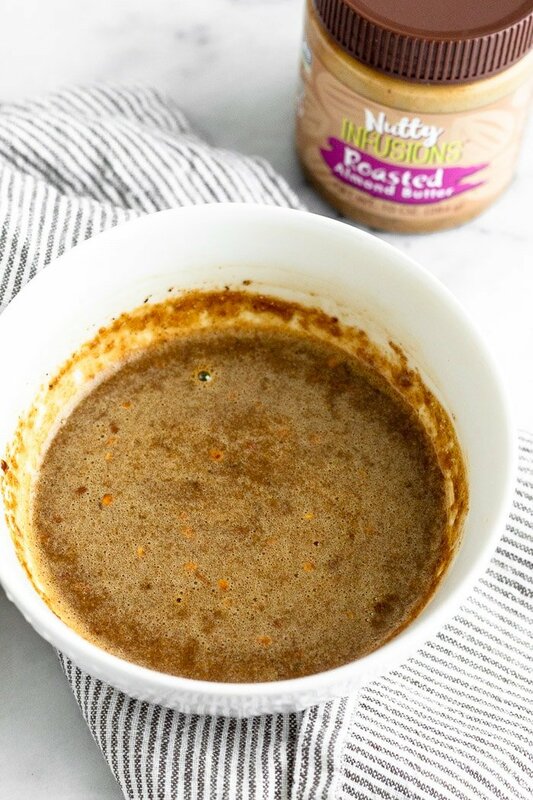 The almond butter and cashew butter are my favorite, and the cashew butter would be a great substitute for almond butter in this recipe! A few notes about tamarind paste – I would highly suggest getting it as it is essential in Pad Thai. It is a unique flavor and I absolutely love it – a little sweet, but also pretty sour. You can find tamarind paste at Whole Food, in your local Asian grocery story, or on Amazon! Just make sure you get pure tamarind paste and there isn’t any added sugar. 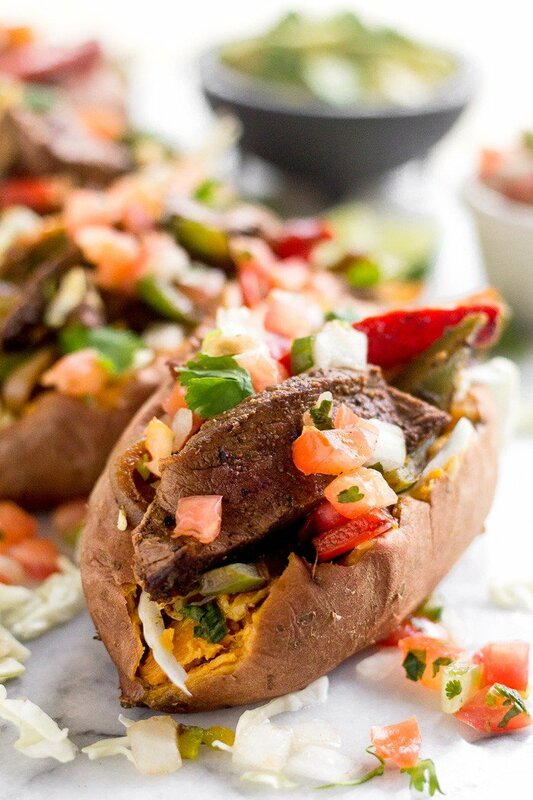 This recipe is great for meal prep! 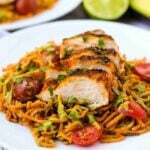 Make it on the weekend and portion out servings for meals during the week. It saves well and reheats well too. I actually just like eating it cold for leftovers, but I know not everyone likes cold food. As it sits, the flavors come together even more too. To store it, keep it in a tightly sealed glass container – we love these compartment containers. Keep the toppings separate (you can keep them in the smaller compartment) and once you are ready to eat, heat it up and then add the toppings. 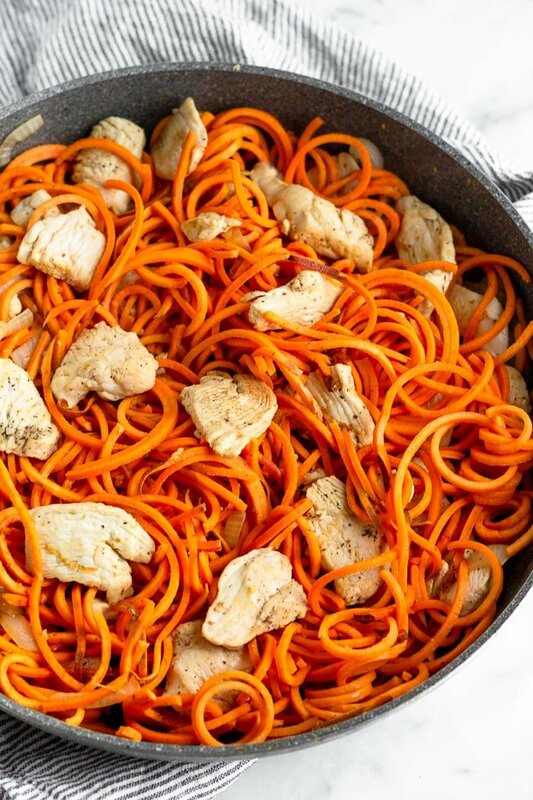 Run your sweet potatoes through your spiralizer and set aside. Make the sauce. 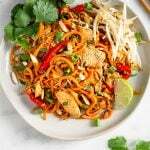 In a small bowl, combine the coconut aminos, almond butter, rice vinegar, fish sauce, lime juice, tamarind paste, red pepper flakes, and salt and pepper and mix to combine. Set aside. In a large sauté pan over low heat, add 1 tablespoon oil and let it get hot, about 30 seconds. Add the eggs and stir constantly until scrambled, but not cooked all the way through, about 1-2 minutes. Remove and set aside. Turn up heat to medium and add onion and sauté until softened, about 2 minutes. Add chicken and garlic and cook for another 2 minutes, stirring occasionally, until chicken is slightly browned on the outside. 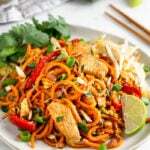 Add sweet potato noodles and sauté for 4 minutes, stirring occasionally. Add in mushrooms and bell peppers and sauté for another 2 minutes. Add sauce and mix well to combine. Let simmer for 2 minutes until everything is cooked through and flavors are combined. Turn off heat and stir in green onion and cilantro. Serve with sides of choice and enjoy! This dish is a keeper! So quick, so delicious, and made awesome leftovers. We were so full after “1 serving” and 100% satisfied. 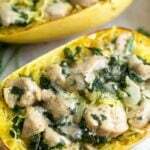 Will be making this again, even when we’re not doing Whole30. So happy to hear that Jen! Thank you for trying it and glad you liked it!